Rudding Park is a Grade 1 listed country house sitting grandly amongst 2,000 acres of land, complete with its own church. Owned by the Mackaness family since 1972, so very much a family affair, it’s situated just a short drive from the picturesque town of Harrogate, famed for Betty’s Tearooms (which is worth a visit), it’s also well placed off the main motorway. Well-incorporated in the surrounding parkland, sleek modern design fuses perfectly with the nature outside and often the two intertwine, especially in the spa. It’s a spacious hotel with lots of grounds to explore. Ask for one of the ground floor rooms that has its own patio and if you’re lucky you might get to stay in the one Tom Jones and Robbie Williams have frequented (not together! ), complete with a roll top bath, TV in the bathroom and a separate lounge area. The hotel saw the completion last year of their now award-winning spa, which is reason alone to come to the hotel. Spread over 3 levels, the Spa is where it’s at. It’s extremely light and spacious, even when it's busy you don't feel packed in like sardines (although coming at the weekend it feels a little less spacious). Most of the facilities are situated on the top floor, where half of the spa is open to the elements; a large whirlpool is situated on the rooftop garden, which can be enjoyed in any weather. The heat and mist from the pools adds to the drama and atmosphere, which makes the whole experience feel really special and unique. There’s a large swimming pool and what feels like a lot of steam rooms and saunas, including a rasul. On the bottom floor nestles the therapy rooms in a more cocoon-like space where treatments take on a spiritual focus. I had the kundalini massage; a treatment that claims to rebalance chakra points and simulate kundalini energy on the spine. The claim is a little far-fetched but the idea behind it is interesting. It was an extremely light-of-touch massage, with slow and fluid movement along the spine, interspersed with a hot compress to make it feel even more soporific. The beauty of this spa comes with the rooms that follow your treatment, split into 4 zones of relaxation. You can choose to spend time ‘coming round’ either by lying on a bed in the dark to continue your relaxation or, as I chose to do, sit with one of their coffee table books. I had a dinner booked in the restaurant and I didn’t want to be a sleepy mess. This is a spa where strict health is cast aside in favour of bottles of fizz, making a great celebratory day out. Who doesn’t like to sip champagne whilst overlooking the parkland views with your feet in a foot spa? 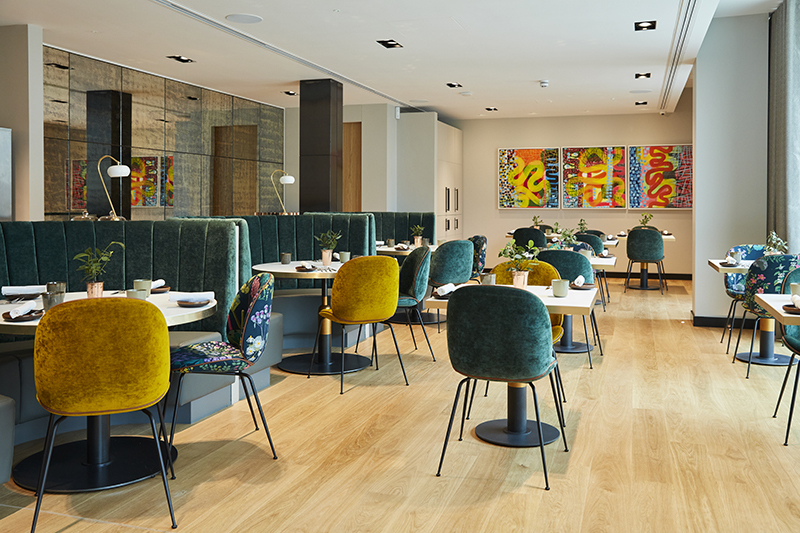 Fans of Tom Dixon design will really love Horto restaurant. On-trend furnishings and a jewel-like colour palette make this restaurant space a destination simply for its design, but also a joy to spend time in. Which is just as well, as the restaurant favours tasting menus only in the evening. Opt for the 6 course menu with wine flight. The fresh produce comes direct from the hotel gardens and changes daily. Having won 2 rosettes recently, the food here is aiming for a Michelin star and it is not far off it. Young, extremely efficient and informed staff add to the experience. Breakfast can also be taken here. As well as the traditional cooked offerings, the on-trend smashed avocado, the difference being the zaatar etc. What's more, guests can glide down in their robes, as it is part of the spa restaurant. Although this can make the restaurant feel not as luxurious, there’s a dividing feeling between daytime and night-time glamour thanks to the natural light during the day and the clever evening lighting. It kind of works. The great surroundings, the covetable design of the restaurant and the spa... of course. I’d rush back in a flash. The main restaurant in the hotel is The Clockhouse. Against Horto, it feels a bit dated and it’s also pricey. It could really do with a bit of an update. 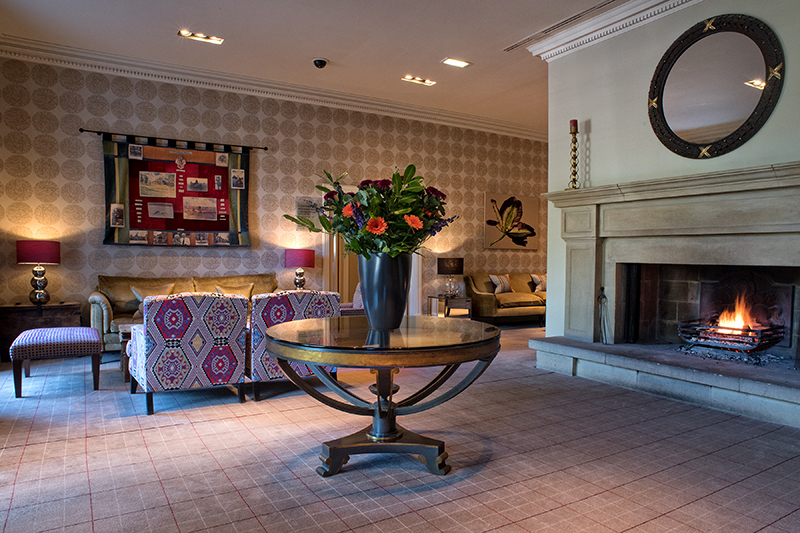 From £189 per room per night or from £185.50 per person per night for a spa break, inclusive of dinner, breakfast, access to the spa during your stay and one 50-minute spa treatment from the spa-day menu.